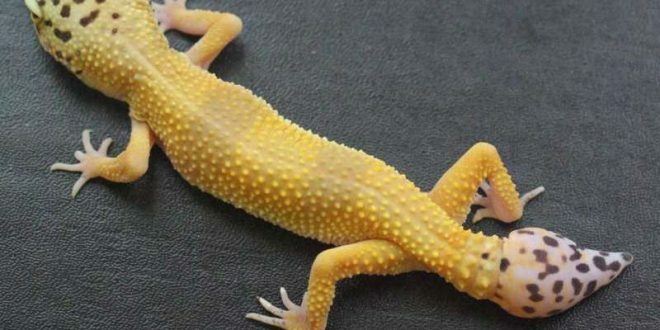 A University of Guelph scientist is the first to discover the type of stem cell that is behind the gecko’s ability to re-grow its tail, a finding that has implications for spinal cord treatment in humans. Many lizards can detach a portion of their tail to avoid a predator and then regenerate a new one. Unlike mammals, the lizard tail includes a spinal cord. Prof. Matthew Vickaryous found that the spinal cord of the tail contained a large number of stem cells and proteins known to support stem cell growth. Geckos are able to re-grow a new tail within 30 days – faster than any other type of lizard. In the wild, they detach their tails when grabbed by a predator. The severed tail continues to wiggle, distracting the predator long enough for the reptile to escape. In the lab, Vickaryous simulates this by pinching the gecko’s tail causing the tail to drop. Once detached, the site of the tail loss begins to repair itself, eventually leading to new tissue formation and a new spinal cord. For this study, the biomedical sciences professor, along with PhD student Emily Gilbert, investigated what happens at the cellular level before and after detachment. They discovered that the spinal cord houses a special type of stem cell known as the radial glia. These stem cells are normally fairly quiet. Humans, on the other hand, respond to a spinal cord injury by making scar tissue rather than new tissue, he added. The scar tissue seals the wound quickly, but sealing the injury prevents regeneration. This study is part of a series of investigations into the regenerative abilities of the gecko’s central nervous system. The next step is to examine how the gecko is able to make new brain cells, said Vickaryous.